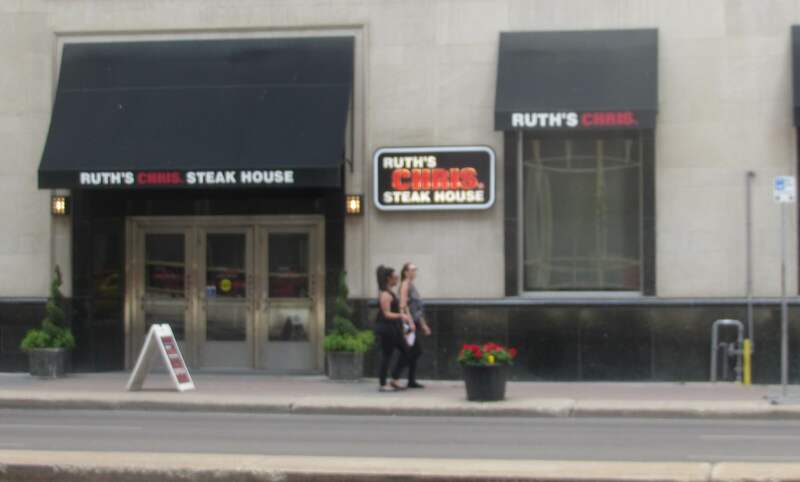 There are Ruth’s Chris Steakhouses all over the world (it began in the US) and I have been told that it is the largest ‘White Tablecloth’ Steakhouse chain in existence. Apparently, the rather odd name stems from the fact that a woman named Ruth purchased a very popular establishment called Chris Steakhouse. She wanted to capitalize on the name but couldn’t under the terms of purchase and instead just added her own name at the beginning. The specialty of the chain is that they grill their steaks at 1800 degrees and then serve them on a 500 degree plate in sizzling butter. 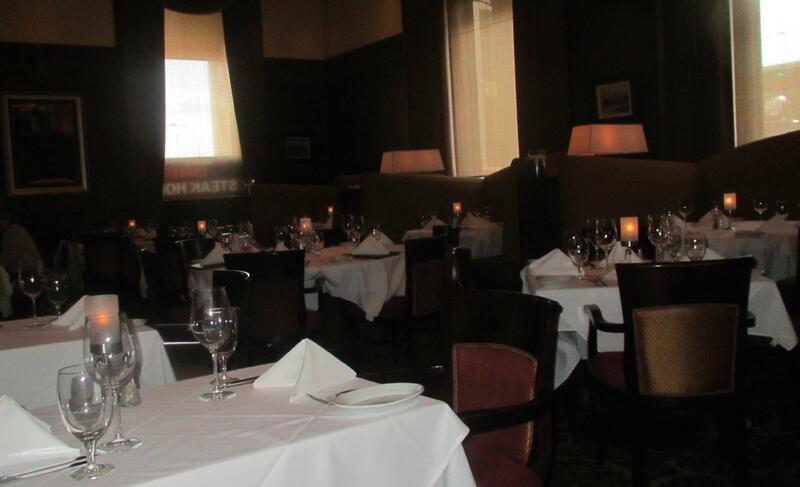 The restaurant is divided into a dining room and a lounge. The lounge, which has a very well-stocked bar, has the same menu as the dining room but is more casual. The dining room, in contrast is very elegant and dark with wood paneling, plush curtains and gleaming tableware on white cloths. I arrived at 6pm and there a few patrons eating already. There is a pretty substantial staff on duty and I was greeted, seated and drinking my first beer in short order. To illustrate the aforementioned expense of this place, the beer was priced at $14, which is about twice what it would cost elsewhere. My waiter, who was very friendly and quite garrulous, explained the menu to me without prompting and answered all my questions. I learned from him that Ruth’s serves both corn-finished USDA beef, and barley-finished Alberta Prime Beef. He told me he preferred the sweetness of the corn-finished beef but I wanted an Albertan Steak and opted for the latter. 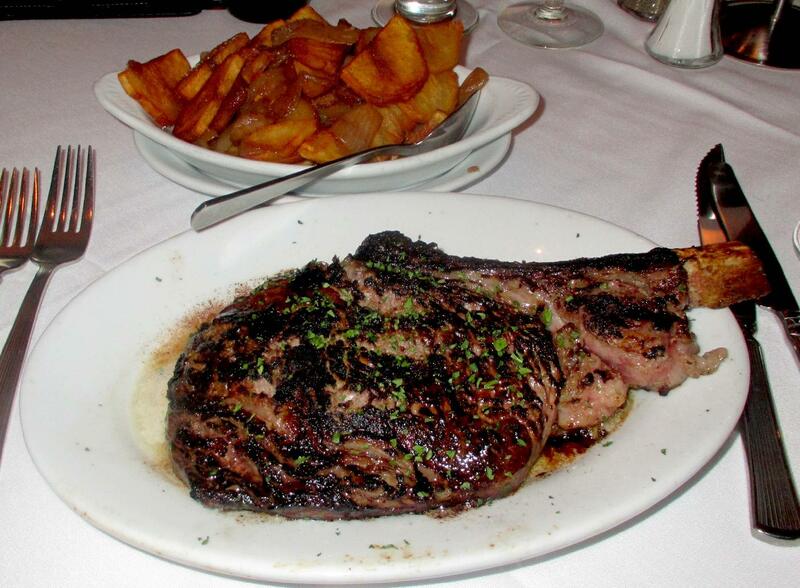 Cowboy (Bone-in) Rib-eye – As always, I ordered my steak a Chicago style (charred) Medium Rare with Lyonnaise potatoes as a side. The prices for these two items were $69 and $8, respectively but the price was worth it as my steak was in my personal top three best ever. The charring was done to perfection, the meat properly medium rare, and it was so exquisitely tender that it almost melted as I chewed. The seasoning was very understated, not much more than salt and pepper, I don’t think, and the sizzling butter was a very nice addition to the whole taste experience. I was a little doubtful about the butter, as I am not keen on whole butter cooked at very high temperatures usually, but this turned out to be lovely. As for the potatoes, they weren’t what usually think of as ‘Lyonnaise’ as they seemed to be regular ‘home-fry’ style potatoes done to crispiness before being tossed with slow cooks onions. Still, they were excellent even if the portion was WAY too big for me. I was very thankful I hadn’t opted for an appetizer and I rated my (substantial) meal at a well-deserved 5 out of 5. To all those who avoid chain restaurants on principal, I say give this place a try. Expensive? Yes … Worth it? Definitely. My whole experience rates this place a 5 out of 5. This looks like a similar experience to ours 3 years ago in Deadwood, SD. We shared that steak.